You just know it. This PCS, you’re all over it. You have checklists for your checklists and you’re filled with confidence in the days and weeks leading up to the latest PCS move that this will be the military move that you’ll kill it and wow everyone with your organizing expertise. You won’t be completely wiped out once it’s all over, and you’re filled with the surety that No, of course our orders couldn’t change! Yes, and then…the moving company falls through at the last minute, the whole family is hit with a violent 24-hour bug in the hours before your carefully-planned-out-to-every-last detail-except-for-the-possibility-of-flu move that you’ve decided to handle yourselves (Personally Procured Move or DITY, “Do It Yourself”), or you find your active duty spouse AWOL for the moving process due to a deployment or other pressing military duty. 6 Laughable PCS Mistakes We’ve All Made! 1) Forgetting we’re not really in charge of anything. Your checklist is checked, you’ve aced the “final out” from housing, and things are rolling along smoothly. But wait! Assignment orders changed right as you watched the last truckload of your belongings trundle off. Think it can’t happen? Just ask a “salty spouse” or two. Expert milspouse tip: Utilize your TMO office! This happened to us while we were stationed in Germany and my husband was deployed—his PCS orders changed after our HHG were long gone and vehicle shipped. I gathered all the paperwork and walked into the transportation office to beg for help as to what to do next. Bearing homemade cookies and approaching it nicely certainly helped my cause! 2) Not setting aside important documents and valuables. Once upon a time, a family was moving overseas and discovered their passports missing…after their whole house had been packed. Yes, that was us. And yes, we had set aside a ‘do not pack’ area which the movers had blissfully ignored. Thankfully, we (and by we, I mean my husband) were able to gain access to the warehouse where our boxes had been deposited and were lucky enough to locate them. This was also the move where I learned to lock passports, jewelry, and other important items into the trunk of my car before the movers arrived. 3) Not realizing how much the kids will need you. Especially if they’ve been through it multiple times, it’s easy to forget how hard a PCS move can be on your kids. With our four kids, it seems that each of them took a turn having an especially difficult time with each move. Patience and grace will go a long way during this time of transition. Expert milspouse tip: Help kids feel ownership of the move by involving them. Let them pack a special bag for the plane or car trip, help sort out their rooms, and make time to say goodbyes. 4) Exceeding household goods weight allowance. Unfortunately, it is SO easy to overpack and so hard to let go of things, even that battered Tupperware you’ll never use again. Know your household goods weight allowance and take time beforehand to sort your belongings and either donate or hold a huge garage sale. Also remember that, if you’re moving overseas, housing tends to be much smaller and you may need to put some of your belongings into storage before the move. Expert milspouse tip: Do you know that you may be entitled to “pro gear” as a spouse? Check out the DoD’s “It’s Your Move” for the latest guidance. You may be allowed up to 500 lbs. of professional gear that won’t count against your weight allowance. 5) Making assumptions about your new location based on hearsay. While crowdsourcing or neighborhood reviews such as those on Military Town Advisor are helpful, realize that many reviews are left by the disgruntled. Don’t make decisions about lodging, housing, or anything else based on a couple of bad reviews! 6) Not understanding how to file a claim for lost or damaged HHG. Hopefully, all went smoothly with your move, but if it didn’t, do you know you must file a claim for damages within 75 days? Time has a way of passing during the madness of a move and settling into your new location, so it’s best to do it as soon as possible. 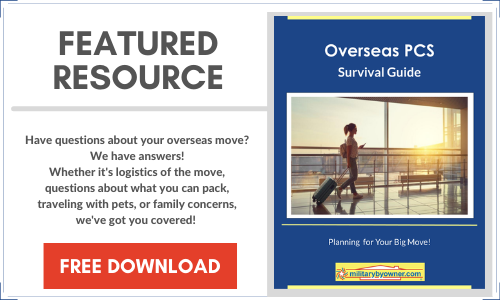 Expert milspouse tip: The Military OneSource website is funded by the DOD and provides up-to-date information about all aspects of a military move, including the process for filing a personal property loss claim after a move. Check it out! While there are many other PCS mistakes we’ve all probably made (and we hope you'll share yours! ), here’s wishing you a successful and smooth PCS! By Jen McDonald. Originally published by Military Spouse. Used with permission.